In this blog post, I will present a simple tutorial on uploading a large file to Amazon S3 as fast as the network supports. Amazon S3 is clustered storage service of Amazon. It is designed to make web-scale computing easier. Your Secret Access Key is a secret, which only you and AWS should know. It is important to keep it confidential to protect your account. Store it securely in a safe place. Never include it in your requests to AWS, and never e-mail it to anyone. Do not share it outside your organization, even if an inquiry appears to come from AWS or Amazon.com. No one who legitimately represents Amazon will ever ask you for your Secret Access Key. The Access Key ID is associated with your AWS account. You include it in AWS service requests to identify yourself as the sender of the request. The Access Key ID is not a secret, and anyone could use your Access Key ID in requests to AWS. To provide proof that you truly are the sender of the request, you also include a digital signature calculated using your Secret Access Key. The sample code handles this for you. Your Access Key ID and Secret Access Key are displayed to you when you create your AWS account. They are not e-mailed to you. If you need to see them again, you can view them at any time from your AWS account. Go to the Amazon Web Services web site at http://aws.amazon.com. Point to Your Account and click Security Credentials. The Security Credentials page is displayed. Your Access Key ID is displayed in the Access Identifiers section of the page. To display your Secret Access Key, click Show in the Secret Access Key column. You can use your Amazon keys from a properties file in your application. Here is sample AmazonUtil class for getting AWS Credentials from properties file. In this tutorial, my sample application uploads each file parts to Amazon S3 with different threads for using network throughput as possible as much. 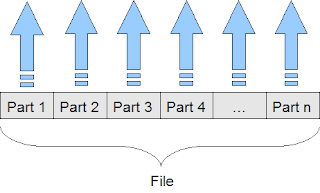 Each file part is associated with a thread and each thread uploads its associated part with Amazon S3 API. 1. Send a MultipartUploadRequest to Amazon. 2. Get a response containing a unique id for this upload operation. 3.1. Calculate size and offset of split-i in whole file. 3.2 . 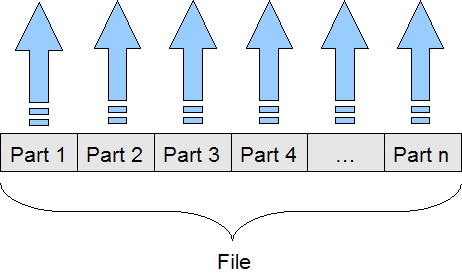 Build a UploadPartRequest with file offset, size of current split and unique upload id. 3.3. Give this request to a thread and starts upload by running thread. 3.3.1. Send associated UploadPartRequest to Amazon. 3.3.2. Get response after successful upload and save ETag property of response. 5. Get ETags (ETag is an identifier for successfully completed uploads) of all terminated threads. Amazon joins all file parts as target objects. // Last part can be less than part size. Adjust part size.